Since winter is upon us humidification for your guitars should be something that is on your mind. I have tried all sorts of different products for humidification and each has their pros and cons. So for those of you who like the idea of humidipaks, but don’t like the idea of the cost associated with them Oasis humidifiers are something you should check out. These have the benefit of lasting a good while between refills and they humidify the guitar case environment quite well. The oasis humidifiers are offered in both a guitar-specific model and a case humidifier model and are like little canisters that you fill with water to humidify your guitar. Once the water is added a gel-like substance forms within the canister. This substance has two benefits: 1.) Spilling is less likely and 2.) It makes the moisture last a bit longer. Oasis has really come up with a fantastic product with the Oasis OH-1 Guitar Humidifier and after using it for several months now, I am convinced that it is the best one available on the market. Initially, it seems to be a very simple device, consisting of little more than a yellow cylinder with a cap on the end, however, the innovation and technology that has gone into this product is actually quite amazing. At the heart of the device is the unique way that it distributes moisture and also shows when a refill is needed. 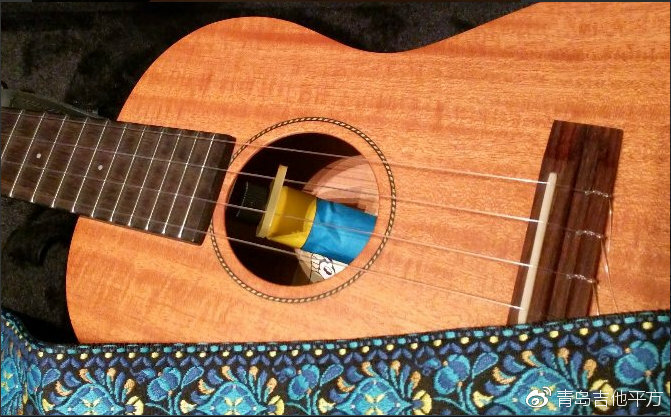 The body of the Blue Oasis Guitar Humidifier is made from a specially designed fabric that allows water vapor (but not water) to pass through it. As the vapor transmission takes place, a vacuum is created and Oasis shrinks to compensate for the loss of water. By watching the Oasis humidifier shrink, you can determine when it is ready for refill. When refilling, you don’t have to guess when it is full. Simply unscrew the black cap, fill with water to the top of the container and replace the cap. 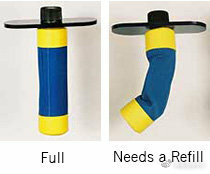 Once sealed, the watertight container is your first line of defense against leaks. Humigel, the super absorbent polymer crystals inside the Oasis Humidifier, are your second line of defense. Humigel captures up to 500 times its weight in water in an absorbent gel matrix. The Oasis humidifier suspends itself conveniently from the strings and hangs down into the sound hole of the guitar. It fits snugly when the guitar is in its case and there is no danger of water dripping onto the guitar because the humidifier cap holds all of the moisture securely inside. Another great thing about the humidifier is that it not only lets moisture out when the air is too dry but it also takes excess moisture out of the air when the air is too humid. Guitars don’t fare well when the air is too dry or to moist so the Oasis humidifier is great for all environments. The humidifier also comes in a set, packaged as the Oasis Guitar Humidifier and Hygrometer and comes as a Oasis Case Humidifier. The hygrometer lets you know the amount of moisture in the air within the case and its a great way to know if your efforts are working or if you need to more. If you want to give your instrument the best protection from dryness and humidity then the Oasis humidifier is highly recommended.